Choctaw Hog are domestic pig raised by Native Americans for meat. Unfortunately there are only a few hundred left and are considered critically rare. 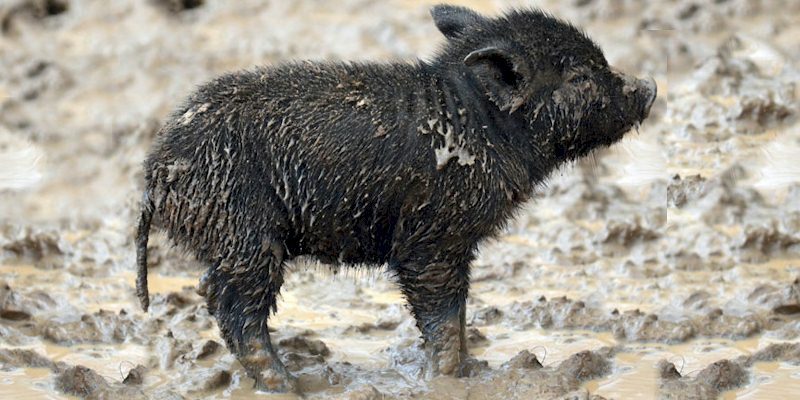 Choctaw hogs are black, sometimes with white markings, and grow to about 120 pounds. Choctaw hogs have two distinctive characteristics: their toes are typically fused forming a single hoof like that of a mule, and many have fleshy wattles on each side of their necks. Choctaw Hog descend from livestock brought to the Americas by Spaniards in the 16th. The Choctaw Hog was used not only by Native Americans but also by European settlers. The Choctaw people and their livestock migrated from the Deep South to Oklahoma Territory in the early 19th century. The Choctaw tribe still raises these hogs in Oklahoma. Choctaw Hogs require relatively little care and are traditionally allowed to run free on open range and forage for acorns, berries, invertebrates, roots, vegetables, and whatever else they can find.